Aloha and welcome to the Department of Electrical Engineering at the University of Hawaii. 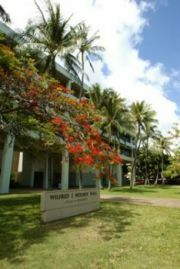 We are part of the College of Engineering on the Manoa valley campus, located in the city of Honolulu. The campus is just a few miles from Waikiki Beach and the Diamond Head landmark. We offer Bachelor of Science (BS) programs in Computer Engineering and Electrical Engineering, a Master of Science (MS) program in Electrical Engineering, and a Doctor of Philosophy (PhD) program in Electrical Engineering. Both BS programs are accredited by the Engineering Accreditation Commission of ABET. The BS program in Computer Engineering is a joint offering with the Department of Information and Computer Sciences. Our department aims to provide quality education, research and service to our constituents. The major goals are to educate a new generation of electrical engineers to meet the challenges of the future; create, develop, and disseminate new knowledge; and to promote a sense of scholarship, leadership, and service among our graduates. To achieve our mission, our programs are designed to achieve our Undergraduate Program Educational Objectives and Program Outcomes and Graduate Outcomes. Assistant Professor, position number 82957: full-time, 9-month, general funds, tenure-track faculty position. Assistant Professor, position number 84683: full-time, 9-month, general funds, tenure-track faculty position.